If you love making a LOT of art and craft projects for yourself and family, you may sometimes find yourself with more craft items than you know what to do with. While you can get in the flow and create a whole series of handmade gifts that you can give as birthday or Christmas gifts, and they are no doubt appreciated by the recipients, it can wear thin or simply become a very expensive hobby to keep making items without any returns on your investment in materials. I used to make enough crafts that I never really had to buy gifts for family and friends. I loved learning new craft skills, and I believe most people enjoyed the gifts they received. But it did become a bit expensive to feed my need for constant materials. Well, one of the ways I found to self-fund my hobby of handmaking gifts was to always make a few items extra that I would sell at weekend craft markets or take to a local gift shop who would sell them 'on consignment'. This worked really well for me for many years while I lived in the Eastern suburbs of Melbourne, as stores (and customers) were in plenty and were affluent. I even funded some large household purchases that I wanted to buy but cost hundreds of dollars that I didn’t have, so I made extra batches of gift cards and sold them to little milk bars and craft shops, and quickly made enough to buy them. Another way to raise money, move craft items you no longer love, or simply have too many of to even give away, is to book a stand at your local weekend Trash'n'Treasure or boot sale markets. It does mean getting up early and setting up your display table or stall at about 7 in the morning, and having to sit in the sun all day, but you can make quite a bit of money, as well as also selling any old used nick nacks from around the house that you don't want any more. To sell your items always consider their eye appeal as far as presentation and packaging goes. 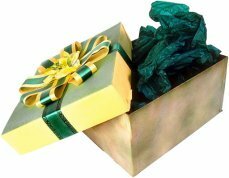 This can be a gift box that you can buy for a couple of dollars or clear cellophane boxes. I also bought a commercial roll of cellophane wrap from a wholesale supplier. That roll has lasted me for 20 years so far, so it was a small investment in the long-term convenience. This is a big cost saving of buying those small sheets you get in the gift wrap section. But when you first start out, look for attractive cardboard sheets you can use for backing, or attractive paper plates/platters that you can rest the item on or even pin/glue in place for perfect presentation. Then you can wrap that with a sheet of gift wrap clear cellophane, or use an Oven cooking bag you can buy in packs of 10 at a time. Sticky tape or tie with an attractive ribbon. If you are selling seasonal gifts you can attach a gift tag as well. Lots of men will buy gifts for women when they are all wrapped and ready for them to just sign their name on the tag before they hand it over to her! ... if you package your handmade items for the seasons. Just have a look at the types of crafts you like to work on, and make a list of the various ways these items could be packaged to suit seasonal gifts. Sometimes it just needs you to make the packaging colors suited to the season… red for Valentine, pink for Mother, Yellow for Easter, Orange & Black for Halloween, Red & Green for Christmas. 3) Fill the need for all year Special Occasion Gifts. It is pretty simple to work out how to package gifts or gift sets or gift baskets that are in demand 365 days of the year. Sports / Hobby themes that you know are in demand in your town. If you like knitting baby bootees and bonnets, you can pin them to cardboard and pack in a cellophane bag and sell for a few dollars. You can also choose to pack them into a gift basket, add a color co-ordinated dummy, some wet wipes, a baby bottle and other baby items that you think suit your theme. Knit a tiny teddy bear to add as well to increase the value to the basket - you get the idea! 4) Are your craft items perfect for Gift Baskets? One of the most flexible ways to package your handicrafts is to incorporate them into a Gift Basket. Decide on the theme and list the types of products you would like to have in them. If you make hand made soaps and lotions you can simply wrap them in cellophane and sell them individually, or you can pack them in a spa theme gift basket. And you don't have to personally hand make EVERYTHING in your gift baskets... feel free to add inexpensive stocking stuffer type of items to complete the package. Add a facewasher - embroider or knit a trim if that is your craft, or a net scrunchie scrubber or loofah. 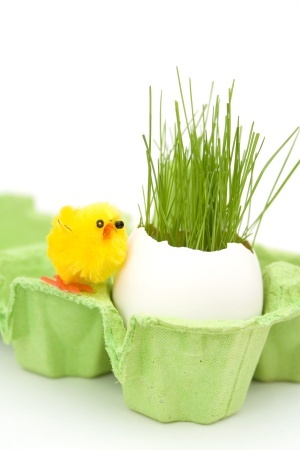 You can often buy very inexpensive tiny bottles of bubble baths and other bathing accessories that are great fillers for your basket. Add a scented candle if you make those, or a bag of potpourri of flowers from your garden mixed with some commercially made. Remember to scrunch up some tissue / crepe paper / shredded paper in the bottom of the basket to raise up the items in the basket, or they will all be sunk down in the bottom and not display as well. Line it with color themed tissue or crepe paper and place your items so that they are tallest at the back and shortest items at the front. Wrap with cellophane and tie at the top with a big bow. 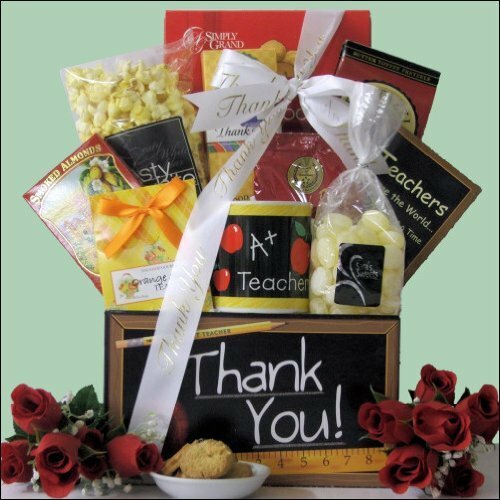 I have created a whole section of the site here to give you ideas and show you how to make gift baskets. These are absolutely perfect for giving to your family and friends as special gifts... and all the materials are paid for by the sales you make of spare baskets at the market! You may be surprised at the amount of smaller retail outlets that will be happy to buy your items if they are good quality and well priced. Items like soy container candles for instance, do really well in all those New Age stores every suburb has. 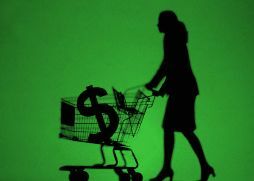 Some stores may not want to buy your stock, but will offer to sell it 'on consignment' instead. That simply means that you trust them to care for your items, they display them and sell them for you, usually keeping 10 - 20% of the retail price as their cut for selling the items for you. Since the stock will need to be displayed on shelves and handled by customers, sometimes for months, before they sell, make sure they are well wrapped to stay clean and not get damaged. Make an arrangement to visit the shop at least once a month to check your stock, replace any that needs refreshing, and to collect your payment for items sold. You will need to keep good records of the items (and the prices) of the stock you leave with stores on consignment, so that there are no arguments later on about what you are owed. And if the store doesn't sell much stock, you are better off thanking the store owner for their efforts, and taking your stock to another store that has better chance of moving more quantity for you. I am planning to start posting my crafts for sale on eBay, as I know a lot of people are moving their stock this way. Just go there and do some searches for your type of craft products and see if anyone else is successfully selling their own. Learn from what they do, and do it better! It takes a bit of effort for packaging and posting the items to the successful bidder, but since you keep the majority of the profit, it is worthwhile. Remember when you plan what stock to make that it will need to be durable enough to handle all the packing and shipping to arrive in good condition at the customers house. You also need to make sure the item will not be too expensive to ship... it need to be reasonably lightweight, as well as tough. Go to your local weekend craft Markets and do some research to see if your style of product would sell or not. Don’t worry if someone there already sells similar stuff, as that just means there IS a market for them, and it won’t hurt to give shoppers a bit more choice. If you have a few card tables, pack them in the car along with a couple of folding chairs. Otherwise you can usually rent a trestle table at the venue. If your items need electric power to operate, you need to make special arrangements to have your stall placed near a power source. I suggest that you try to find a sheltered place out of the sun and wind, as it can be a real pain to watch your potpourri sweating in its cellophane bags in the sun, or to have to fight all day with the wind trying to blow your stock off the table. When I lived in Rye I was able to take part in weekday markets held inside a shopping center at Frankston, so check if your local shopping center ever holds market stalls during shopping hours. I noticed that my local Coles shopping complex has a few stalls operating on Thursdays, so that is a venue for me to check out to sell crafts during weekdays. Be negotiable and be prepared to cut your prices if you want to go home without any stock – have fun. It is important that you only sell your lovingly made items while it is fun to do so. Many people make very good money from their hobbies. 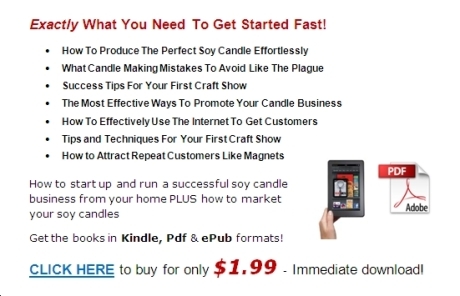 Some soy container candle makers are even able to create a full time home business that replaces their job! But be aware that this is not always the case. You do need to take a business approach to it if you want to be profitable. Often people will find that what was a fun hobby instead becomes just another chore, or becomes very stressful, because they now have to think ‘commercially’ about every aspect of their craft. 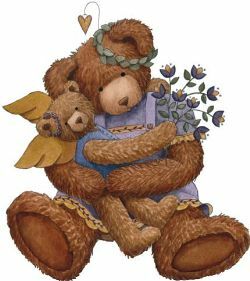 So if you find that you are not having as much pleasure in the crafting of your items, or that the selling process eg: going to Markets every weekend, is just too tiring, or you are not making any decent profits for your efforts, just stop doing it for money and get back to having fun! In my personal opinion it is much more important that you keep doing your craft for fun and pleasure, and continue to delight the people who receive them as gifts, than to be profitable. I have done a mix of all the above (eBay will be in the next few weeks!) to sell my crafts, which included dried flowers and potpourri, handmade soaps, soy container candles, stationery, knitted dolls/bears/baby clothes etc, crochet shawls and pot holders and golliwogs and toys/animals, sewn fabric dolls and toys and patchwork quilts and clothes, decorated woven baskets, embroideries, gift baskets, cooked puddings, jams, sauces, spiced oils & vinegars, gourmet spiced salt and herb bouquet garni, natural herbal beauty sachets and products, decoupage boxes and tins, oil paintings, stained glass overlay and so on. Over the years the results have been mixed. You will need to try the various venues and methods for selling for yourself before you find the ones that work best for you. If you are serious about turning a hobby into a home business, you will need to properly learn how to sell handmade crafts online or locally at a genuine profit, not just small change! 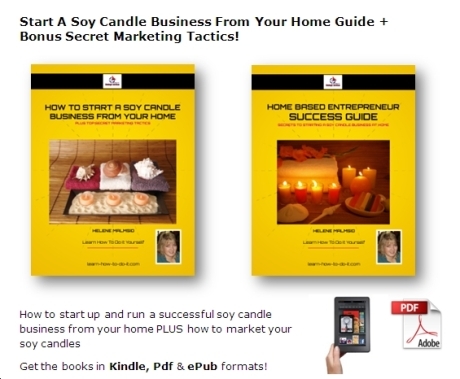 One of the most popular home business crafts is to make soy container candles. I have published a book that only costs you a couple of dollars that covers the entire process in detail, as well as outlining your business plan to help ensure you succeed in your home business. Below here I'm featuring more pages with helpful how-to-do-it tips on how to sell handmade crafts online or locally. Back to HOME PAGE of this how to sell handmade crafts online or locally section of the site.